Best dog of its kind in America. 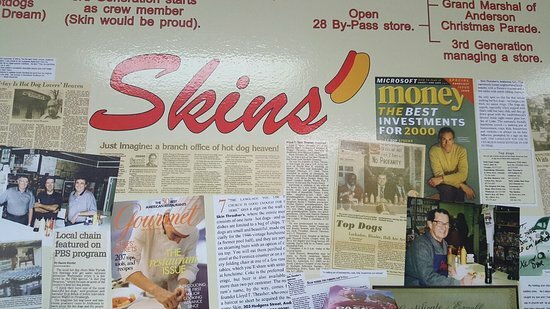 This Skin’s has the best hotdogs In Anderson, SC. They have great service and the employees there are always cheerful and ready to wait on you! 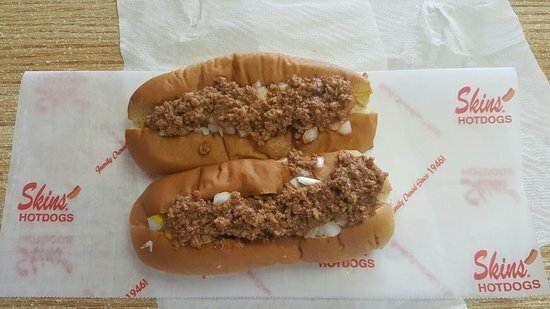 Great hot dogs. Always crowded. You have to wait on a table. No alcohol. Good for families. They also offer soft drinks, chocolate cake, pickles, and chips. Lived in Anderson in the 90s. Would bring my kids here to eat as a treat. Was excited to visit and have one "all the way" Skins did not disappoint. Best hot dogs ever. Thanks we always like good honest reviews. We work very hard to maintain our quick service and quailty. Get quick answers from Skin Thrashers Hotdogs staff and past visitors.